I love the premise of this book, and overall really enjoyed Screwed. I felt so badly for Grace. Didn't we all made mistakes at that age? She made a mistake and has to pay for it in a big way, while Nick, her baby's father, wants his identity as the father to remain a secret. Grace has one good friend, Jennifer, who is on her side. Everyone else, even people she thought were friends, shuns her. The worst betrayal is from her own parents, who can only see the damage to their social standing when Grace refuses to get an abortion. Grace's parents kick her out, and before she endures any physical trauma, her kind neighbor takes her in. I really enjoyed Grace and the other characters in this book, especially Helen and Charlie. I wish that Screwed would have been a first person narrative, with Grace as the narrator, because I think that would have made for a more personal book. I couldn't help comparing Screwed to Karen Hart's Butterflies in May (read my review here), another coming-of-age story based on a teen with an unplanned pregnancy. One thing that really bothered me about Screwed was the language. There was a lot of cursing, especially the f-word, which started to get to me. I don't like it when cursing is used too liberally in teen books; while I understand that four-letter words are a big part of most teens' vocabularies, I think too much of it cheapens the book. My favorite thing about Screwed was how Plissner resolves the conflict at the end of the book. I loved that Grace, Charlie, and even her parents experience a lot of character growth and positive change throughout the story. I really enjoyed Grace's trip at the end of the book and thought it was a fitting end to her journey. 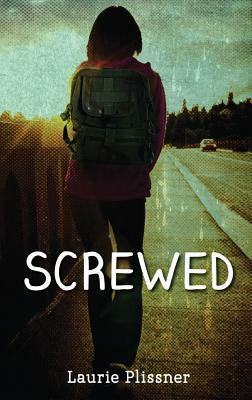 Overall, I enjoyed Screwed and would recommend it to fans of coming-of-age novels and fans of mature YA. I would definitely read Laurie Plissner again. Might be more suited to my tastes... I don't mind the f-bomb... I'm terrible at not using it myself. Bad, I know... but the truth. Still it sounds like a decent story.